The unofficial start of summer is here! 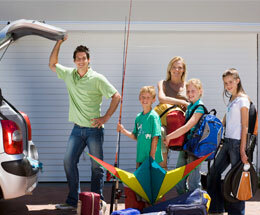 This means many families are making plans or final arrangements for this year’s summer road trip. According to researchers, summer road trips are still very popular among families. The two main reasons are flexibility and packing ease. If you’re planning a summer road trip with your family, here are some things to consider. 1. Give your car a tune up. Before hitting the road, it’s important to make sure your car is working properly. Consider visiting your local mechanic or check the following items yourself. Motor oil. Depending on the number of miles you’ll be driving, it may be a good idea to get an oil change before you leave. At the very minimum, read your dipstick to determine the current oil level. If the oil is below the add line, consider adding the oil recommended for your car. Tires. Driving a car is one of the most dangerous things you do on a regular basis. Tires play a key role in keeping you safe. Before going on a long road trip, check your tire pressure and inspect your tires for cracks, bulges, or objects stuck in them. In addition, make sure you have adequate tire tread. Tire tread is important for pushing water out from underneath you so that you can maintain control of your car. Poor tire tread can lead to hydroplaning. Windshield wipers. Windshield wipers are often neglected when it comes to routine maintenance. Yet, like tires, they’re very important to keep you safe. Windshield wipers take a beating from the elements. The last thing you need is to be caught in a torrential downpour with poorly working wipers. Consider replacing them every six months. Brakes. If your feet experience an unusual pulsating when you press the brake pedal, or you hear squealing or squeaking, it may be time to change them. Depending on how your drive and other conditions brakes may last 20,000 to 50,000 miles. 2. Review your vehicle warning lights. If one of your vehicle warning lights turns on, will you understand what it means? The complexity of cars is increasing. Make sure to refer to your owner’s manual for a complete explanation or check out my blog Vehicle warning lights and their meanings [Infographic]. Insurance policy. If you have any questions regarding your insurance coverage, contact your agent. 4. Pack an emergency kit. If you’re stranded on your trip, there’s not much you can do other than wait for help to arrive. Here are some items to keep in your summer emergency car kit. 6. Consider purchasing roadside assistance. If you do a lot of traveling and don’t want to be left stranded, roadside assistance may be a good investment. Roadside assistance programs can help with small items, including an empty gas tank, flat tire, lockout, dead battery, or towing. 7. Secure your pets. Pets roaming around freely in your car can be distracting and lead to a serious accident. Depending on where you travel, allowing your dog to sit on your lap may be illegal. Make sure you have an adequate size crate or carrier for your pet or consider alternative restraint options. 8. Remain calm. During summer months, drivers face many different road conditions and driving situations. There are more cars on the road and construction zones can be confusing and frustrating. The best piece of advice is to remain calm. Driving erratically or showing your emotion can lead to dangerous situations. 9. Pass the time. We’ve all been involved in car ride squabbles. Make sure your family has plenty of activities to help pass the time in the car. DVDs, smart devices, and the license plate game are just a few ideas. Don’t forget extra batteries. 10. Share your itinerary. Make sure you share your itinerary with family or friends. This way they’re familiar with your travel plans if you need help. 11. Have fun. Don’t forget, the purpose of your road trip is to enjoy quality time and make memories with your family. Roadside Assistance: Do you really need it?